I started playing ice hockey again this Fall, and, you guessed it, our team name is…The Honey Badgers. Cuz honey badgers don’t give a sh*t. Honey Badger’s badass. I threw my hat into the ring to design our logo. There are a LOT of really bad, cheesy, trying-too-hard honey badger t-shirt designs out there, so I wanted to go in the other direction. I wanted it to look more like a professional hockey team logo, and letting the funny honey badger youtube video stay in people’s heads. This is my progress so far. I’m probably going to add “Honey Badgers” text to it, so no one mistakes it for a skunk, and maybe add a couple small bees and a dead cobra at it feet–not sure. I’m definitely going to add some small jagged fur line treatments to the black area, too. It’s going to be pretty…well…badass! What do you think? 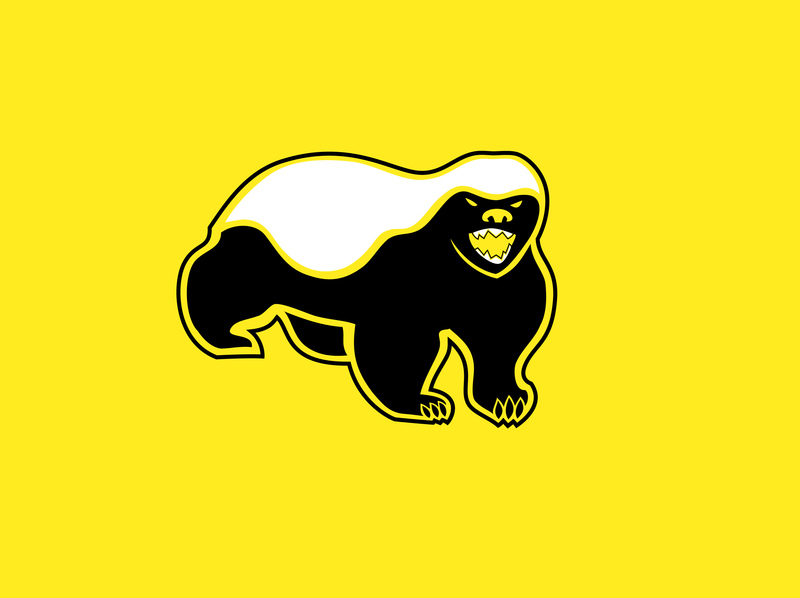 Started up a hockey team this year and we’re the honey badgers – was wondering if you ever updated the logo? I’d love to use it for our team. Agree w you – there are so many brutal HB images out there. I’m glad you like my logo. The finished logo ended up getting refined a bit. I’m always happy to allow use of my artwork for a very reasonable fee. Something even a beer-league hockey team can afford! Sure – I just subscribed to your blog, can you send me an email and we’ll sort it out there?